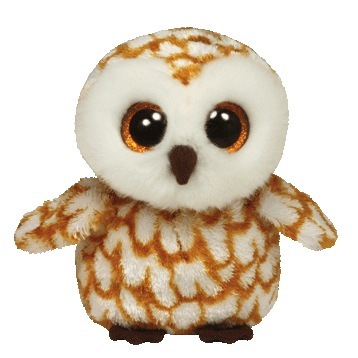 Swoops is made from a fuzzy white material covered in a brown feather pattern. His face is made from a fluffy white material and he has a brown beak and feet. His large button eyes are sparkly gold and black. So I fly around by the moonlight! Swoops the Barn Owl was introduced on 19th June 2013. This is the small 6″ Beanie Boo version of Swoops. He was also released as a medium 9″ Beanie Boo Buddy and a key clip. This is the second Beanie Boo to be called “Swoops”, the first being Swoops the Bat.